Having recently returned from the 2010 eduWeb Conference in Chicago, I’m feeling energized! I was sure that I would come back with great ideas for search engine optimization (SEO) or tips for website redesign projects. And I did. There were great presentations about brand messaging online, SEO, social media, web development, and more. The biggest take-away for me, though, was an unexpected one. Twitter. Not the what or the how. But the why. Insert shock and disbelief here. As the person chiefly responsible for the university’s primary Twitter account (@umflint), shouldn’t I have been on the bandwagon long before now? The short answer is “yes.” While I understood the fundamentals behind successful customer service and brand management using Twitter, I had yet to embrace the power of Twitter as it related to UM-Flint. I knew we needed to “be there,” but wasn’t sure what we might get out of it. Walking into my first session at eduWeb, I noticed that the vast majority of attendees had their laptops out and were busily typing away. “Wow,” I thought. “This must be a group of really hard-working people!” It wasn’t until the session had officially begun and people were still actively typing that I started wondering what everyone was up to. Looking around, I recognized some note-taking, email checking, etc. But that wasn’t all. Was that Tweetdeck? Were these people tweeting? They were. Wasn’t it rude to be tweeting while a presenter was speaking? What in the world could be going on in the world of Twitter that was so important? From this first session, we moved into the keynote presentation. With all attendees present, it was announced that tweets from the conference (tagged #eduweb) would be streamed for everyone to read on screens around the room. I didn’t follow. Why would there be such support for a distraction from the conference material? I watched the projected stream of tweets for a few minutes, and then it clicked. These tweeters were actually discussing the conference! They were recapping the important points. They were raising questions. They were sharing resources and recommending reading material. Twitter was actually enhancing the conference experience by generating conversation. And then I was hooked. After retrieving my afore-abandoned laptop, I jumped into the action. By following the #eduweb conversation for the remainder of the conference, I got supplemental advice and made some great contacts. I wound up with a free t-shirt and a list of book recommendations. In fact, it was due to a question I tweeted during “Wrangling the Octupus: Managing Your Social Media Ecosystem,” that led to a face-to-face conversation with the presenter, Aaron Rester from the University of Chicago Law School. He helped me brainstorm and think about the best ways to elevate the brand of UM-Flint using Twitter. He encouraged me to find UM-Flint’s “voice.” Brilliant! Who are UM-Flint’s followers on Twitter? What message do we want to convey to this audience? How will our message elevate our brand? Largely, @umflint’s followers are not prospective students but members of our community. To best elevate our brand, we should be communicating those stories and happenings that highlight us as a “premier urban center for learning, research, and civic engagement.” But there’s more. At “People vs. Web: People Win! 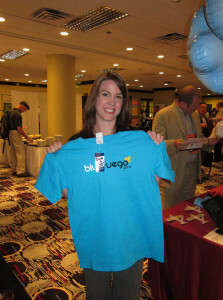 Truly Standing Out on the Social Web,” presented by Howard Kang of BlueFuego, two points resonated with me. First, as tweeted by @bluefuego during the session, it’s important to “cut the barriers of communication *everywhere* you can. Be available.” Second, “The future is about personality. Our institutions have a rare opportunity to be tangible and humanized.” There it was. As Howard explained in his presentation, social media is all about people. It’s not about brands or logos or companies or institutions. By using social media as a means to solely broadcast, we become that “bad date” who talks only about herself. Our social media outlets, Twitter specifically, are opportunities to interact and engage with our audience, to show (not tell) them who we are. Since returning from eduWeb, I am admittedly addicted to my Tweetdeck window. As @UMFlint_Alaina, I continue to learn from my new #eduweb friends and use them as a sounding board for new ideas. Most importantly, I am rededicated to making UM-Flint’s presence on Twitter purposeful and beneficial. I pledge for @umflint that Twitter will no longer be something we occasionally remember, but an outlet for brand-related messages, a source for notes to and about our community, and a point of contact for our followers. Conversations with and about UM-Flint will be monitored and we will respond when appropriate. I now know that Twitter is worth the effort, and an invaluable interactive tool with which to engage others. I am officially hooked. I urge you to follow me.